Heat a pan over medium-high heat, add the unsalted butter and garlic and cook until fragrant but not brown; add the mushrooms and saute until golden brown. Turn the heat to high and add the vermouth; add the cream and cook until reduced by half, about 5 minutes. Season with salt and pepper. Keep warm. 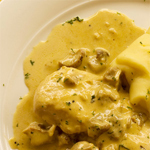 Cut the veal escalopes in half and season generously with salt and pepper; season the flour in same way. 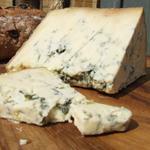 Lay a thin slice of fontina on the veal and 2-3 chives. Roll the escalopes around the chives and dredge lightly in the seasoned flour. In a large pan over medium-high heat, melt the butter and olive oil. Place 3 rolls in the pan, joined side down, and cook for 30 seconds. Turn the rolls over and sear the other side for 30 seconds. Transfer to a baking dish and continue searing the rest of the rolls. Bake for about 10 minutes until the cheese is melted. Serve with the chanterelle sauce. In a bowl, mix the eggs with the sifted flour, add the 20gr of melted butter, a pinch of salt and add the milk slowly while mixing continuously. Cook the crêpes in a pan, you should have enough to make 8. Check our blog for instructions on how to cook them. Wash and dry the radicchio, roughly chop it up and braise in a pan for about 15minutes with 50gr of butter and the finely chopped shallots. Add the wine, adjust seasoning and cook for a further 10 minutes. Prepare the bechamel: Melt the butter in a pot and add the flour. When lightly golden, add the cold milk, whisking to avoid lumps. Keep stirring on a low heat. It should take about 15 minutes to get to the right consistency. Add salt, pepper and a pinch nutmeg. 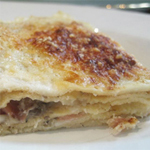 Add half of the bechamel to the radicchio, then use this mix to fill your crepes. Fold them in four and put them on a buttered oven dish. Top with the remaining bechamel and some grated parmesan. Cook for 15 minutes in a very hot oven (220*C). Serve hot! Gently cook the leek and celery in the butter for 3-4 minutes in a covered pot, stirring every so often. Add the stock, season lightly, bring to the boil and simmer for 20 minutes. Add the apple and simmer for a further 10 minutes, or until the apples are soft. Blend until smooth and sieve out any lumps and stringy bits. Add the cream and serve with the celery leaves torn into the soup with the chunks of Stilton and scatter with a little celery salt. Peel the potatoes, slice them lengthways and brown them in 40g of butter. Slice the onions and brown them in the remaining butter. 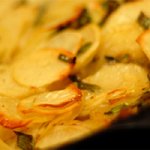 Arrange alternate layers of potatoes and onions in a buttered ovenproof dish. Season with a little salt and pepper, then cover completely with stock. Cook in a preheated oven at 200°C for about 25 minutes, then reduce the oven temperature to 180°C and leave to cook for a further 20 minutes. If required, add a little stock while they are cooking. Wow! I didn't know you were supposed to cook bmheaecl for at least an hour! I am going to have to try that and taste the difference. I learning new things.Welcome to The Foodie Blogroll!